How did the 2018 H2 SX perform in top speed tests?! 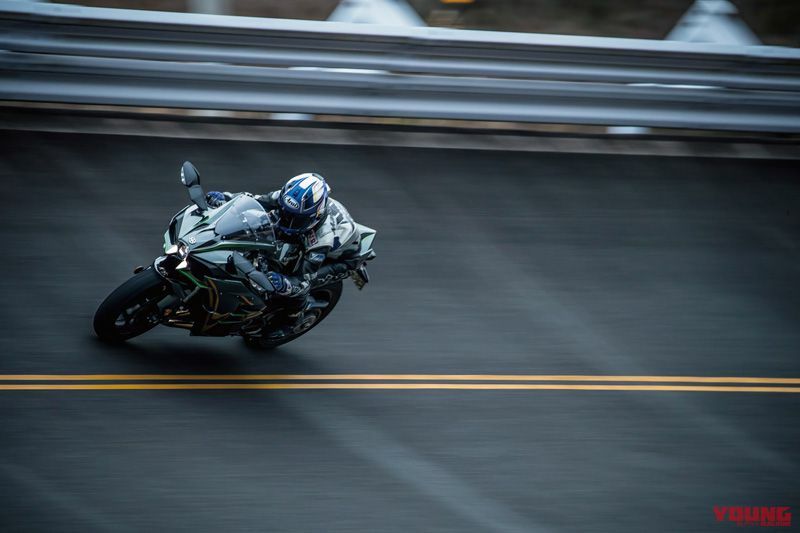 We have tested out the top speed of the new 2018 supercharged H2 SX machine on a high speed oval circuit at the Japan Automobile Research Institute. 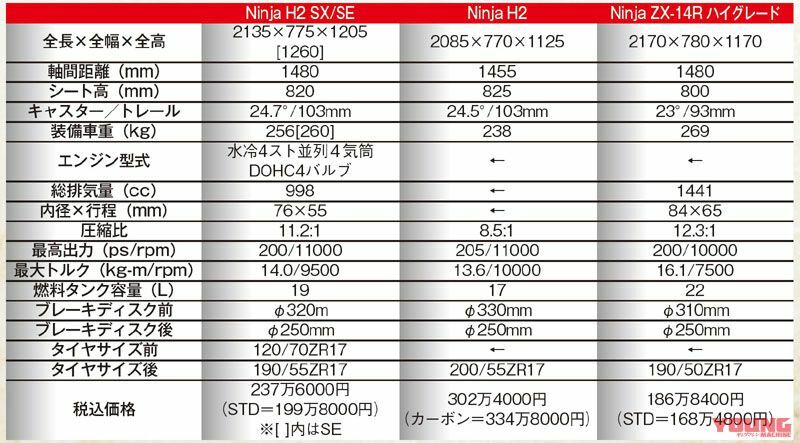 We also did a comparison & contrast tests with the previous H2 and ZX-14R models. So what speeds did the bikes manage to hit?! After having taken the standard H2 SX touring, we decided to fix a date to take it out again and carry out a 0-1000m acceleration test, along with a high speed attack at a high speed oval circuit. 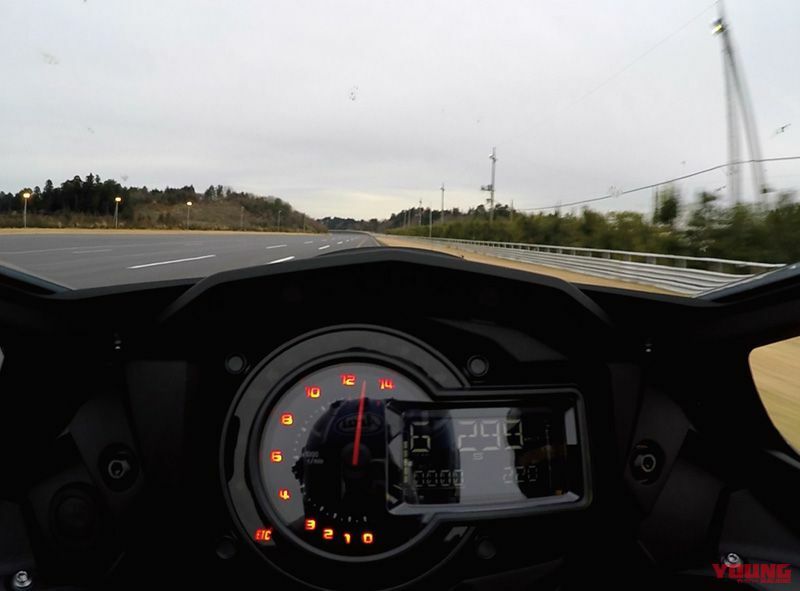 The one thing we did change on the test bikes was to put on a lower screen to benefit any potential top speed? That was our thinking anyway! The highest speed was reached over the redline at 13,000rpm. The meter reading of 299kph was recorded by the GPS at an actual speed of 294.24kph. The engine’s redline was set before putting the limiter into operation. The original supercharged Ninja H2 machine. The 2018 model continues to use most of the high technology the 2017 model was equipped with. The meter reads at 299kph, hitting a true reading of 298.97kph on the GPS. 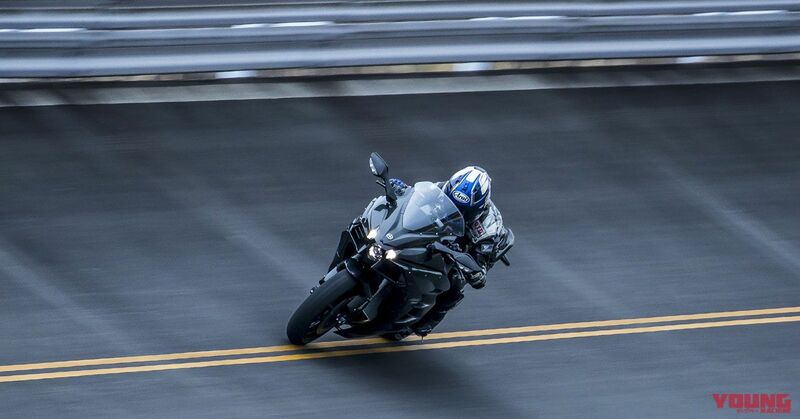 This is the almighty tourer that continued on from the lineage of the ZX-12R. We can just ignore whatever the analogue display shows, and see by the GPS that it hit at actual speed of 298.73kph. Ultimate power 300kph H2 & 14R? Or upper limit 300kph SX? Immediately following completion of 0-1000m, the acceleration of the H2 did not decline as it hurtled all the way at the same pace to its 300kph limiter. After this, we rode out onto the back straight and hit the banks a couple more times. The SX was a little sluggish staying just this side of 280kph, and it did not reach the rev limiter. The H2 reached its 300kph speed limiter rapidly. And after this the 14R hit its limiter. The 14R was the best in terms of stability and stillness. We certainly managed to investigate to what extent the SX is comfortable at the upper limit speeds around 300kph. The JARI (Japan Automobile Research Institute) course is familiar to us here at Young Machine. The high speed oval circuit with banked corners has an overall length of 5500m, and the straights are both 1112m. The 0-1000m measurements were taken on the straights, and from there we broke into high speed attacks. The measurements were carried out using a Dig Spice GPS logger device. In the first sector the 14R is unparalleled, and from the second sector the H2 shows its ability. The boost of the supercharger on the SX offers a welcome sensation, and when the compression ratio rises it kicks out more power, yet it feels more like the 14R rather than the H2 in terms of acceleration. The impression we get is that the SX has been developed in order to allow many more people to experience the pleasures a supercharged engine. The H2 was the first bike to be supercharged, and it has an extremely special and stoic supercar like existence. On the other hand there is the SX, with its cosy riding position and useful latest equipment, not to mention its superb power output than can be managed for normal riding conditions too. The supercharger boost gives a welcome sensation, and if you feel inclined you can get a real hit of adrenaline from the devil like acceleration and distinctive sound. Furthermore, this would make for a more realistic bike to buy for those who can’t afford to splash out on an H2. Also, due to the supercharger it succeeds in allowing you to downsize your tourer from a ZX-14R. The 14R is not an easy bike to potter about through town, but in the case of the SX this is no problem whatsoever. Furthermore, in comparison to the 14R it goes one step further with its orientation towards comfort, and the standard of its equipment is to a far higher level. 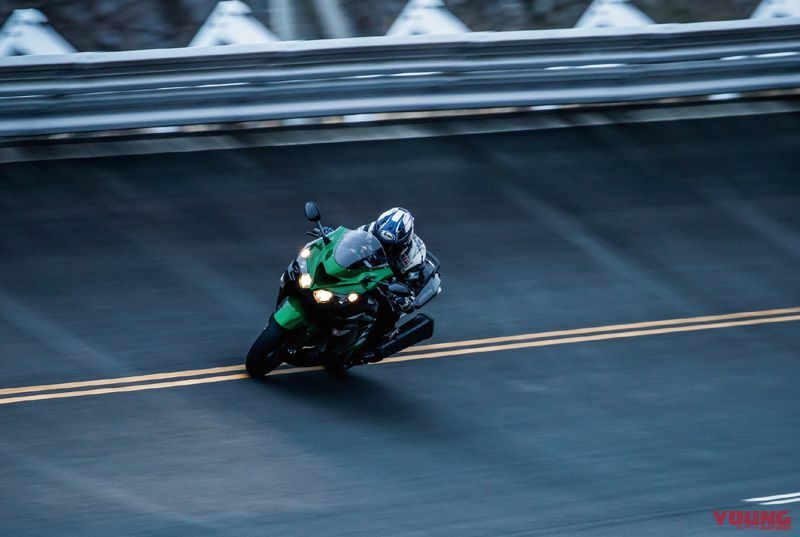 This bike covers a wide domain from a reasonable sporty Ninja 1000, as far as something close to an H2. This is not a bike to replace the former 14R that aimed to be the fastest bike in the world by exceeding 300kph, but instead Kawasaki have been successful in offering a new style of touring bike. To illustrate these bikes, the 14R is like the “gentleman”, and the H2 is the “party animal” that loves going to raves. So I suppose you could say that the SX fits somewhere in the middle of these two, like a “bit of a rascal”, or something. 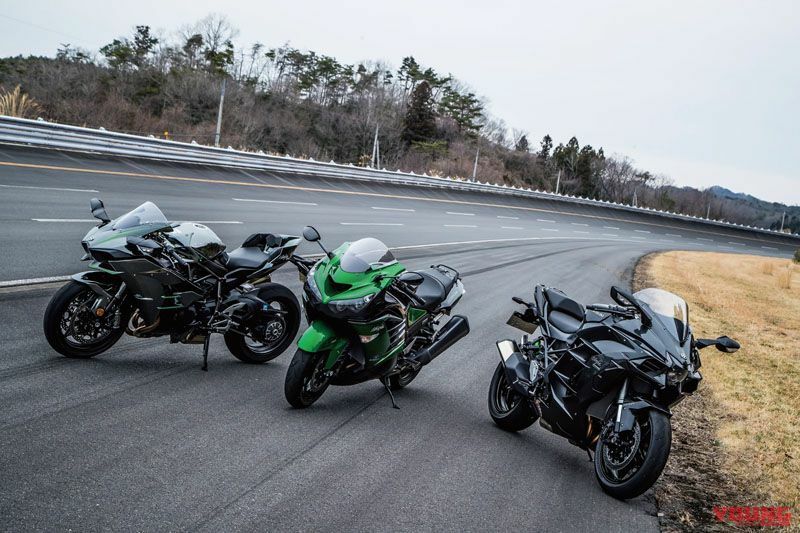 We think these bikes really hit the target and should certainly settle the cravings of any Kawasaki fan. As for the SX it has been right on point in stimulating my imagination towards wanting a tourer bike. And so the appearance of this bike means that it has become the number one thing on my “to buy” list! Will the new model Honda V4 get the go-ahead for development? !